Our training program aims to develop, in each rider, the skills and confidence to shine as brightly as they can. That’s our objective every day, with everything we do. Parkside produces happy, healthy horses and strong riders through its diligent training program. We offer complete board and training through which we work with horse and rider together, as well as individually, to help both meet their full potential. 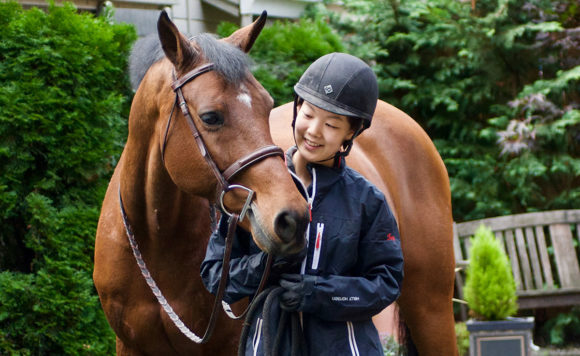 Our clients participate in regular lessons, clinics, and a fun and challenging show schedule. Their horses are given an individualized training program to achieve maximum fitness and responsiveness. Our trainers have taken many horses from green and inexperienced to top ribbons at A-circuit shows. From expert training, to beautiful facilities, see why Parkside Stables is a great choice for riders of all skill levels. Our tailored packages support rider development in all skills. We produce happy, healthy horses and strong riders through our diligent training program. Our students participate in regular lessons, clinics, and a fun and challenging show schedule.